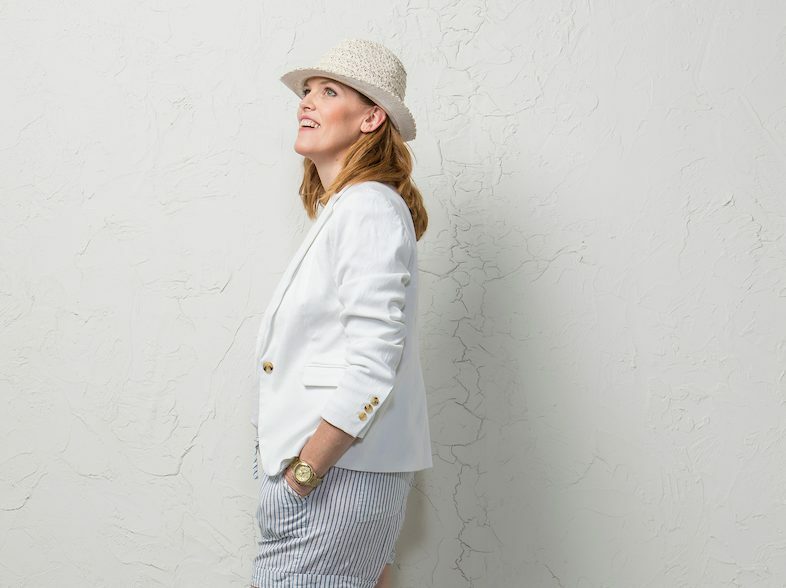 White Blazer and Striped Shorts & Fab Friday Link Up! Wearing shorts in the summertime is my all time favorite, especially linen striped drawstring shorts like this pair I recently bought at T.J. Maxx. 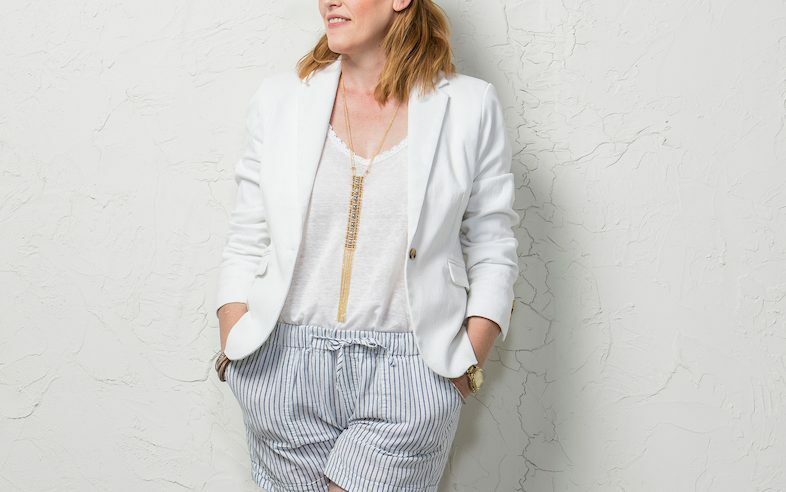 I find T.J. Maxx in general to be hit or miss with quality but when it comes to summer white staples like a basic pair of linen shorts, a white cotton tee or a basic white blazer, you’re pretty sure to find it there at a great value. I tend not to overspend on summer whites as it’s hard to keep anything white, fresh and clean for the next season. So I usually buy the same white basics year after year without feeling guilty and about it! I personally love wearing linen in the summer. It’s a noble fabric that keeps you cool in the warmer temperatures and makes any summer outfit fresh and chic. 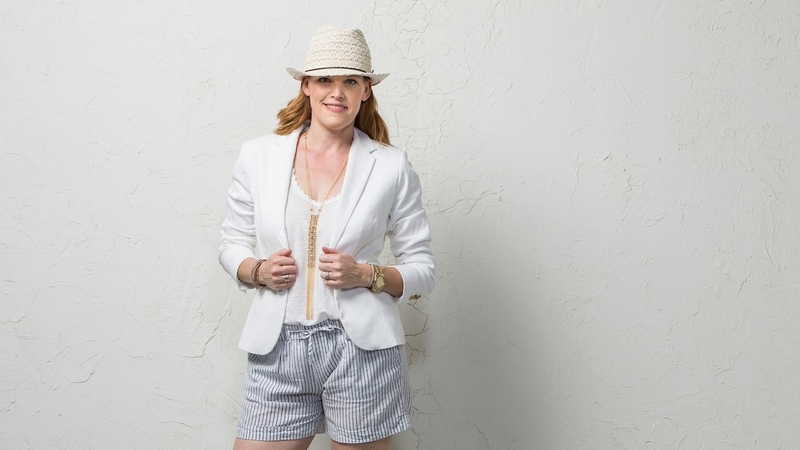 These light blue pinstriped shorts are the quintessential summer staple that you can dress up paired with a summer blazer or simply wear with a simple white tee or linen camisole. A white blazer is a must-have to any French Chic summer wardrobe! I love pairing it with shorts in the day time or with a black silk camisole and denim pants in the evening. Today, I’m honored to be co-hosting the Fabulous Friday linkup with the Fabulous Jennie from A Pocketful of Polka Dots. I love her classic style and how she’s not afraid of wearing colors and mixing fun prints. Share your style with us and meet other fabulous bloggers along the way! Just click on the InLinkz Link-up button at the end of this post. 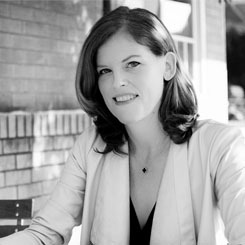 Meet your host for Fabulous Friday, Jennie of A Pocketful of Polka Dots. My pick from last week’s Fabulous Friday linkup is Jessica from Jeans and a Teacup. To Link Up: Follow your host and co-host on at least one outlet and link back to this blog on your site. Make sure you link to a specific post, not just your blog. By linking up you are saying it’s ok for A Pocketful of Polka Dots to send you a short & sweet reminder e-mail. 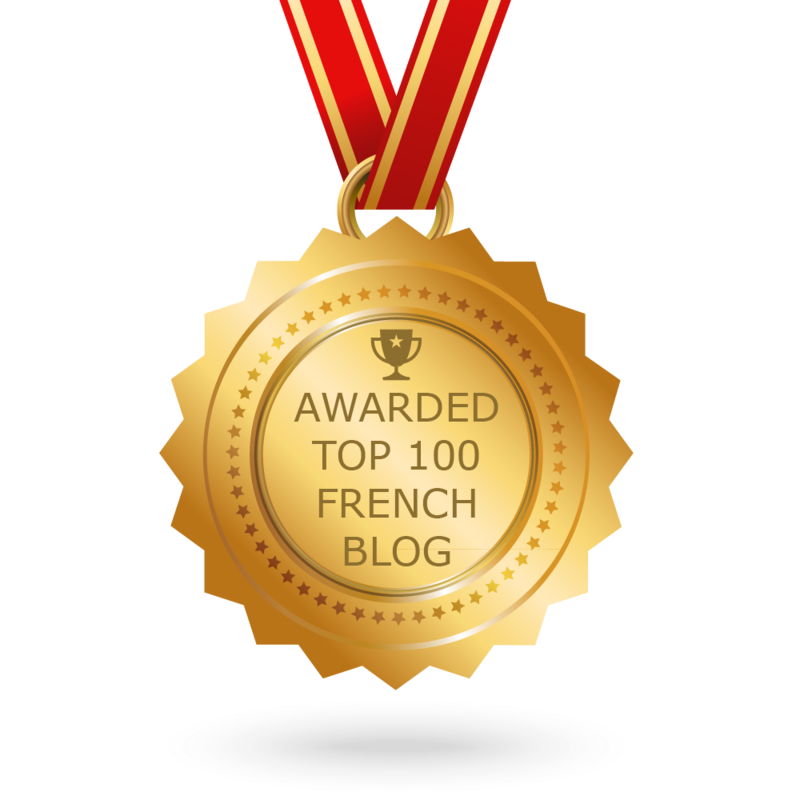 Finally, make sure you go and visit other Fabulous blogs! Cool casual look. Can you add me to the email reminder list for your party? Thanks. Thanks for linking up to Top of the World Style. Hi Nicole, I’m co-hosting the Fabulous Friday linkup with Jennie from a Pocketful of Dots. You’re more than welcome to subscribe to Bon & Chic Style via email though! This is such a perfect summery look! I love TJmaxx as well for trendy items! I adore this entire look head to toe. So classic, but chic and trendy. Drawstring shorts are my summer fave, too! Thanks for letting me linkup today! I am in love with the shorts suit look! You look so fabulous! Thank you for joining the Ladies Who Link Up party! Peace! I love this look, the blazer and shorts combo is perfect. Those striped shorts are so cute! This is the perfect summer look! The shorts are the cutest! This is the quintessential French aesthetic chic look. Love your shorts, a great find from TJ Maxx. I also like the cute fedora on you and yeay for co-hosting another linkup! Last but not least, you should check out my most recent post when you have time, because we are both rocking white with blue+white stripes except my bottoms are white and my stripes are on top. I also have on similar ghilly sandals and a fun neutral hat, Christine. Hey, great minds think alike! I like this light blue pinstriped shorts, the color is full of naturally fresh sense in hot days. I agree with you that whites it’s hard to keep anything white, fresh and clean for the next season. But I still like white t shirt, white dress and white blouse. The white color is really easy to pair with other outfits. I love a white blazer in the summer! Christine, thank you so much for co-hosting with me this week! Shorts and a blazer are a favorite look of mine. I really like how you topped off this classic look with your stylish chapeau! These are wonderful photos. You are a natural in front of the camera. Jennie, it was a pleasure co-hosting with you! Let’s do it again! Have a great end of week! Stopping by from Jennie’s link-up at Pocketful of Polka Dots. Your patriotic outfit is adorable. Very cute detailing on the blazer. And then here you are looking so cool and fresh in this white blazer. I think I need to add one to my wardrobe. My hubs likes a blazer with jeans but had never tried a blazer with shorts. Great look. Yes you absolutely need to add one to your wardrobe and wear it with shorts! Thanks for stopping by! such a cute outfit! love the white blazer!